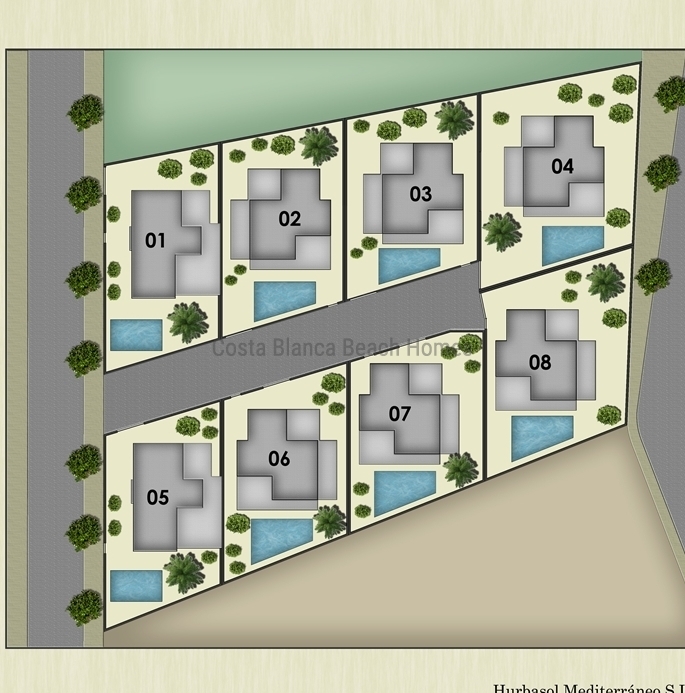 New development of detached houses with private pools built with high quality finishes and materials, in Los Montesinos, just 30 minutes from Alicante airport, 15 minutes from the beach of Guardamar and 6 km from the Vistabella and La Finca golf course. It consists of 8 villas of 134 m2 on 2 floors with roof terrace with beautiful salt lakes views, with private pools on plots of 211.91 m2 to 282.12 m2, the outsides are completely finished with artificial grass, white stone in garden area and perimeter fence with motorized gate for vehicle access. All the villas have 3 double bedrooms, one on the ground floor with ensuite bathroom, guest toilet, 2 bedrooms in the 1st floor and Jack and Jill bathroom fully finished, living room with large motorized windows with direct access to the pool, American kitchen with granite work top, fully equipped with appliances, utility room and large outdoor terraces. Beautiful views from roof terrace. Air conditioning with conducts included. Luxury finishes. FURNISHED WITH COSTA BLANCA BEACH HOMES!